Captain Fish, Sheriff, and their fellow monsters now have two of their own unique sets of evolution cards for both New York and Tokyo! And a new challenger joins them: Mega Shark! In New York, roll 3 Hearts (not necessarily on the same turn!) to draw a card and access violent new Powers! 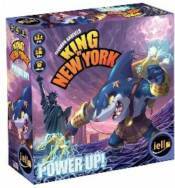 And now, King of Tokyo fans can mix monsters from both games to compete for the supremacy over Tokyo with Evolution cards!